From the bottom of our hearts, we thank you sincerely for responding to our plea for help. Our expenses continue to rise, primarily driven by oil prices. In one area, fundraising, we were able to combine many small efficiencies and reduce our cost by 33%, but areas out of our control, such as electric power, are going upward, and will continue to do so. We continue to need your prayers and your dedicated help. God bless you for it! ANNIVERSARIES: (left) KNOM’s new spiritual advisors celebrate milestones this month. 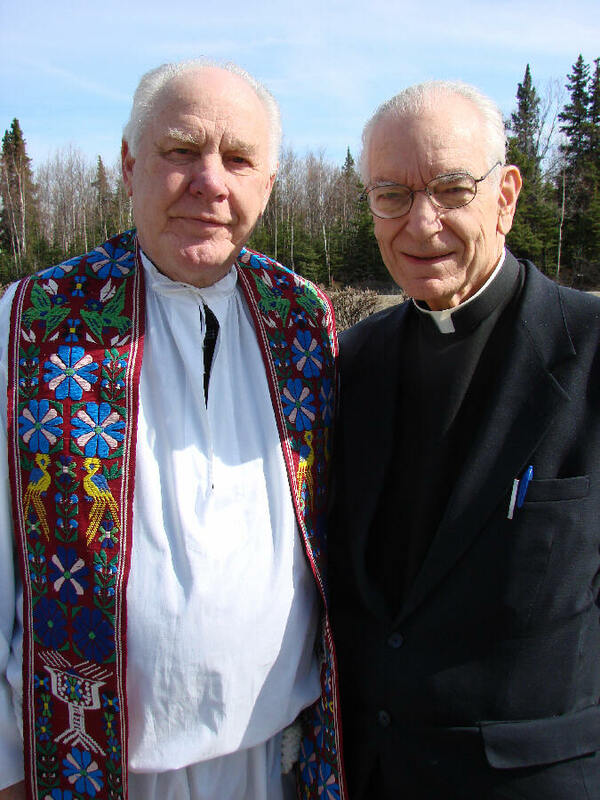 June 14th, Father Vince Beuzer (BYOO-zer), SJ, at left, begins his 60th year of priesthood. Two days later, Father Armand Nigro (NI-gro), SJ, enters his 62nd. The two direct retreats, not only at the Holy Spirit Retreat House in Anchorage, but also all over the state. Frequently, you’ll find them in small villages, many of which KNOM serves, leading retreats for remote Catholics who cannot afford travel. We thank God for the kind help of these two wonderful, spiritual, kind, energetic men. ANOTHER HITCH: (left) We’re happy to announce that inspiration director Dave Dodman has signed up for a second year. According to Dave, there’s nothing like KNOM. “It provides both a source of inspiration and communication,” Dave says, “as well as information and companionship for a very diverse and widespread group of people in western Alaska — a lot of different things for a lot of different people. From central New Jersey, Dave is cantor for St. Joseph’s Parish, leading hymns on piano. Thanks, Dave! We look forward to another excellent year of service. INSPIRATIONAL SPOT: On this day, mend a quarrel. Replace a suspicion with trust. Encourage someone. Keep a promise. Examine your demands on others. Write a letter to someone who misses you. Express your gratitude. Overcome a fear. And show someone you love them. And do it again, and again and again and again. . . . MELT: (left) KNOM program director Kelly Brabec checks out the Bering Sea ice in the second week of May. There’s some water close to shore, and the dark line at the horizon indicates that the ocean is ice-free a half-mile or so out. Often, the ice edge is home for walrus and seals, and with binoculars, you’ll see locals subsistence hunting there. MORE EXPENSIVE THAN GASOLINE: We reported that in a few villages, gasoline is almost seven dollars a gallon right now. KNOM business manager Lynette Schmidt, who feeds a family of eight, points out that in Nome, a gallon of milk last month cost $7.34. For many years, cost of food and supplies in the Alaska bush has been the highest in the United States, since everything must be shipped in by either air, or by oceangoing barge during the brief Arctic summer. This year, it’s compounded by the high cost of fuel for that shipping, as well as for heating oil and for diesel, which is the only source for generating electricity. As a result, the price of everything is spiraling upward. As of mid-May, our cost for powering the 25,000 Watt AM transmitter this year was 26% higher than it was just last year. Ouch! A CAPITAL IDEA: In May, news director Paul Korchin sent volunteer reporter Jesse Zink (left) 1,106 miles to Juneau for “local” news: covering western Alaska issues in the Alaska legislature. Using Associated Press reports, he’s been our legislative correspondent for almost two years. Jesse interviewed Governor Sarah Palin in her office, and spoke with many of Alaska’s doers and shakers. 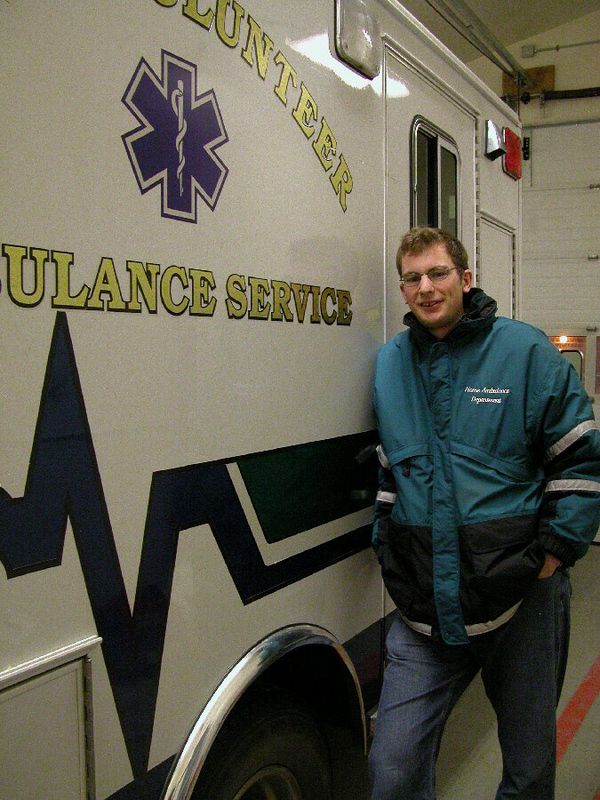 Incidentally, Jesse just elevated to Emergency Medical Technician 2, which is the second level of four. It includes “a couple of crucial additions to skills,” he says. The two-month Saturday course was taught by Mark Hunt, RN, who volunteers for KNOM a few hours a week. The oldest Catholic radio station in the United States — working hard, thanks to you. INSPIRATIONAL SPOT: Have you ever wondered whether what you’re doing is right or wrong? We all do. It’s not always easy to figure it out. That’s why I pray to the Lord every day. INSPIRATIONAL SPOT: Dear God, I don’t know where You are leading me. I don’t know what the next day, or the next week, or the next year will look like. As I try to keep my hands open, I trust that You will put Your hand in mine and bring me home. KA-ZAP! (left) General manager Ric Schmidt inspects a battery-powered Uninterruptible Power Supply (UPS) that keeps critical gear powered during electric outages. In May, Nome’s power company moved to a new generating station, and during the switchover, there were many sudden drops in power, causing loud zapping noises throughout the entire studio building. During that time, several UPS’s like this one loudly complained with screeching warning beeps. Fortunately, everything held and KNOM’s signal was not affected. One casualty was a computer printer, for which the utility will reimburse the station. From Albany, Oregon, Ric was a KNOM volunteer in 1984. The founding general manager of Portland Catholic station KBVM-FM, he returned to Nome in 1995 as program director. Two years ago when 30-year general manager Tom Busch stepped down to take the roles of fundraiser, financial director and occasional engineer, Ric was promoted to his present position. 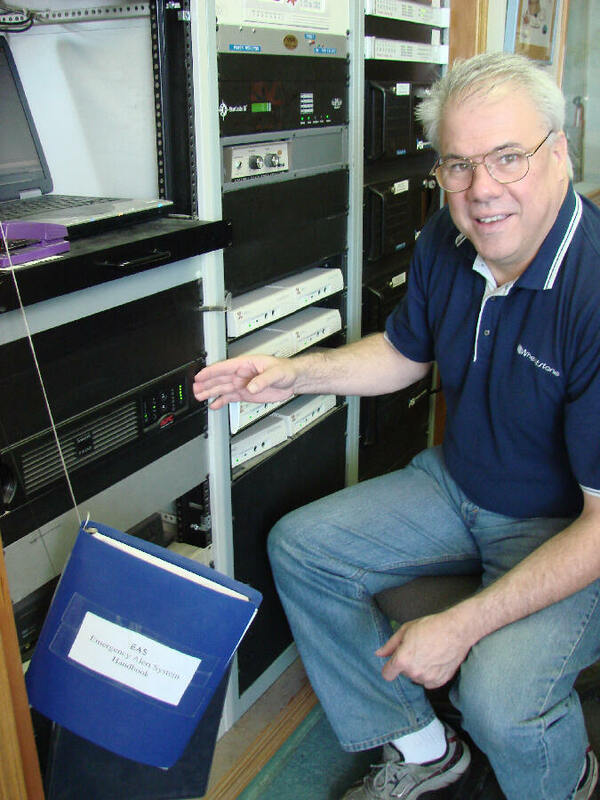 He’s past president of Nome’s Rotary club and the Alaska Broadcasters Association, and is the Nome vice-chair for Employer Support of the Guard and Reserve. a new marine advisory program. The department is headed by Amy Flaherty, who celebrates five years with KNOM this month. Thank you for making these repeating mini-programs possible. WILLFULLY: Please consider adding missions like KNOM to your will. We prayerfully place all bequests into funds that are used only for major improvements and to keep the mission alive through emergencies. INSPIRATIONAL SPOT: Even with Faith, we can have problems. Triumph is right over the hill from tragedy. We have Someone Who loves us just the way we are, as we climb the hill to triumph. INSPIRATIONAL SPOT: Lord, guide my steps in ways of grace, that they may ever be in harmony with the music to which You have set this world. LONELY SENTINEL: (left) It’s an interesting thought that an installation at such a lonely and sometimes forbidding spot brings comfort and companionship to thousands of people. Three miles down the coast from Nome, the KNOM-AM transmitter site still had plenty of snow as May began. 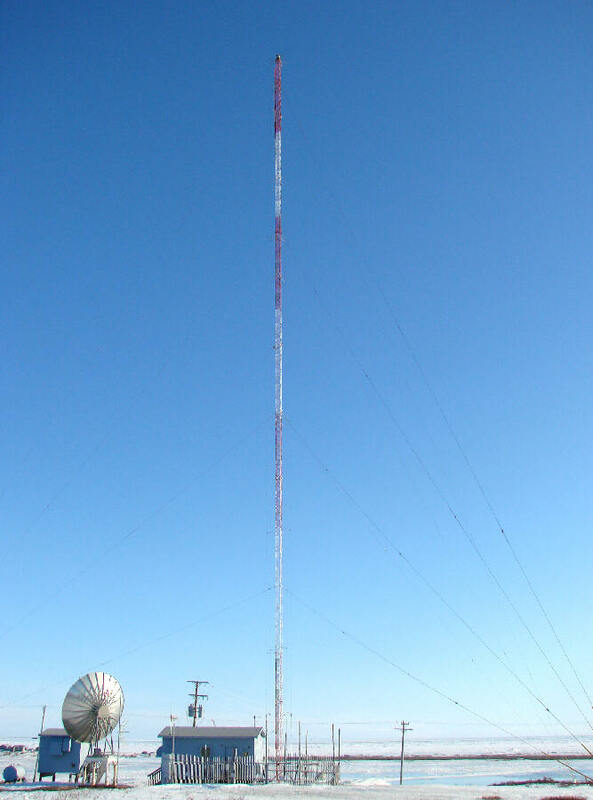 Built in October 1970, the sturdy tower is rated to withstand 150 MPH winds. “I’ve been out there in whiteout blizzards when it was probably blowing 120,” Tom Busch remembers with a shiver. Beside the tower is the transmitter shed, and a generator shed is at left. 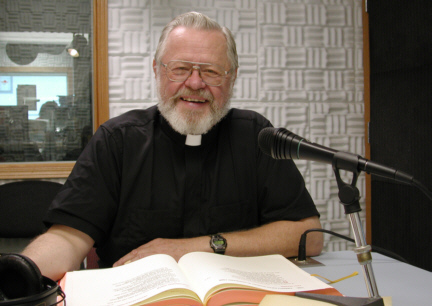 30 YEARS AGO: In June 1977, Father Paul Macke, SJ is in Nome to help the radio station during the summer. Two years later, he returns as temporary executive director, and later is assigned as pastor to St. Joseph’s parish. 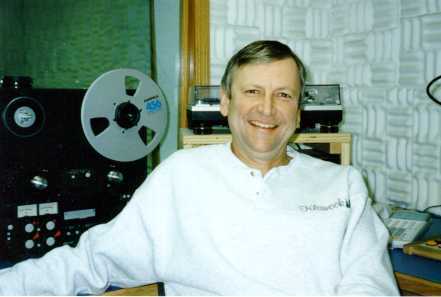 (Left) Father Macke visits KNOM Studio B in 1997. 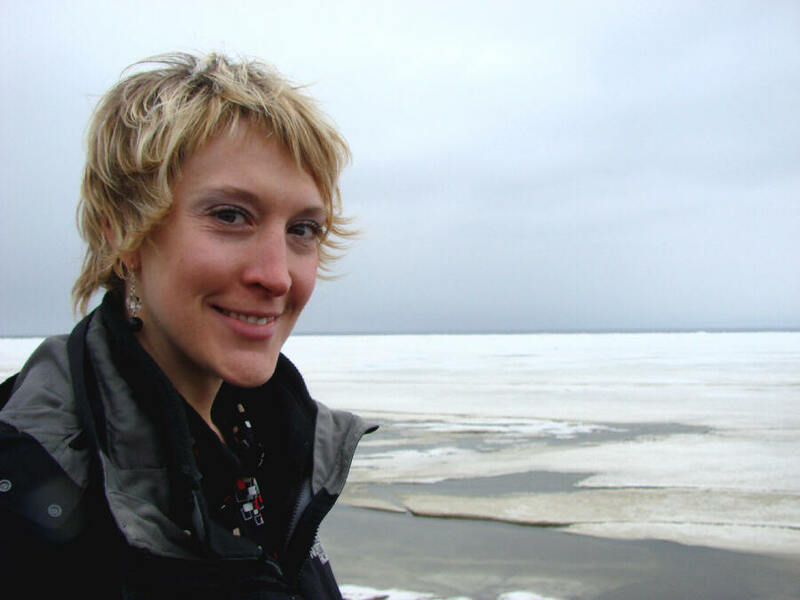 THE GOSPEL: When Father John Hinsvark was pastor of Nome’s parish, Lynette Schmidt recorded him reading every week’s Gospel for all three years of the Church’s cycle. 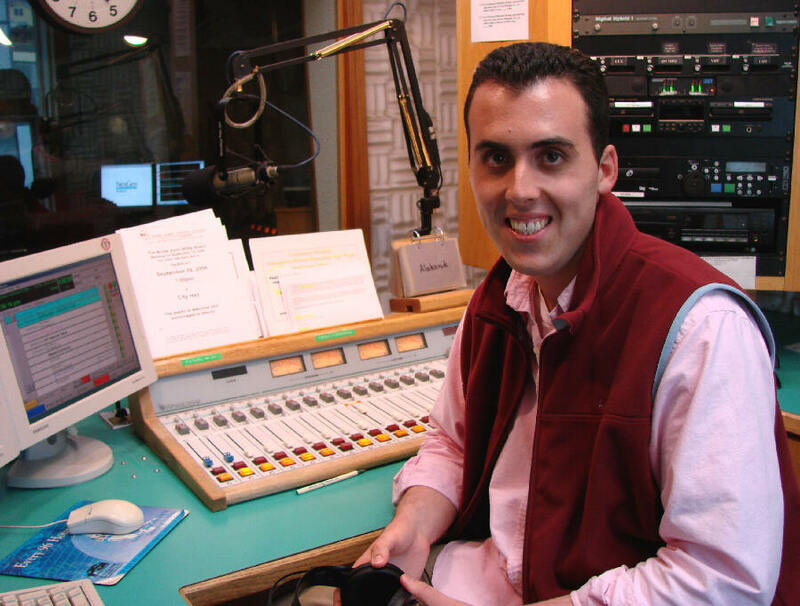 Several times a day on KNOM, you’ll hear the upcoming week’s Gospel, as an inspirational spot. (Left) Father Hinsvark begins recording the series in Studio C in 2002. 17,000: That about how many inspirational spots KNOM has broadcast since January first, as well as the same number of educational ones, thanks to you. We do need your continued help and your prayers, more than we can express. Every day, we pray for you, your intentions and everyone you love. Thank you so very much. God bless you! Copyright © 2007 KNOM. All rights reserved.